Virginia Death Row inmate Robert Gleason has a scheduled date with "Old Sparky" at 9:00pm this evening. Good riddance to a worthless multiple murdering POS! The US state of Virginia is set to use the electric chair to put to death a man who killed two fellow prisoners to speed up his own execution. Robert Gleason, 42, is the first Virginia inmate to choose electrocution over lethal injection since March 2010. The former tattoo artist pleaded guilty to a 2007 murder and has since killed two fellow prisoners, while waiving all his rights to an appeal. Virginia's governor says he will not intervene in the case. So...... as I type only 20 minutes to go. If he is reading a book he needs to be on the last chapter? Lethal injection seems less painful to me. Wonder why he chose electrocution? 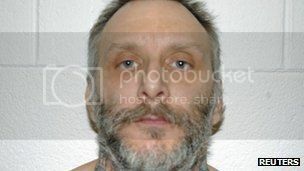 JARRATT, Va. (AP) — A man who strangled his prison cellmate and made good on a vow to continue killing if he wasn't executed has been put to death in Virginia's electric chair. Robert Gleason Jr. was pronounced dead by authorities at 9:08 p.m. Wednesday at the Greensville Correctional Center. The 42-year-old inmate was the first executed in the U.S. this year and the first to choose to die by electrocution since 2010. In Virginia and nine other states, inmates can choose between electrocution and lethal injection. Gleason had fought last-minute attempts by former attorneys to stop the execution. He told The Associated Press he deserved to die for what he did. Gleason was serving life in prison for a 2007 murder when he killed his cellmate in 2009. He strangled another inmate in 2010. That's the way an execution should go, swift & nearly painless. The execution Tuesday of a Texas woman convicted in the gruesome murder of her 71-year-old neighbor will mark the first time in three years that a female inmate has been put to death in the U.S. It was among three slayings linked to McCarthy, a former nursing home therapist who’d been addicted to crack cocaine. Her lethal injection is scheduled for Tuesday evening. McCarthy will be the 13th woman executed in the U.S. and the fourth in Texas, the nation’s busiest death penalty state, since the Supreme Court allowed capital punishment to resume in 1976. In that same time period, more than 1,300 male inmates have been executed nationwide. Federal Bureau of Justice Statistics compiled from 1980 through 2008 show women make up about 10 percent of homicide offenders nationwide. According to the NAACP Legal Defense Fund, 3,146 people were on the nation’s death rows as of last Oct. 1, and only 63 — 2 percent — were women. In a final legal effort to spare her life, McCarthy’s lawyers asked Gov. Rick Perry on Monday to use his executive authority to issue a 30-day reprieve. They also appealed to Dallas County District Attorney Craig Watkins to withdraw or modify the execution date, citing his support that Texas adopt a law allowing death-row inmates to appeal on racial grounds. McCarthy is black, while all but one of her 12 Dallas County jurors were white. Her lead attorney, Doug Parks, said drug use was McCarthy’s downfall. Evidence showed that McCarthy called Booth to borrow a cup of sugar. When she came to pick it up, McCarthy attacked Booth, including forcing the woman’s hand to a chopping block so she could cut off her finger to remove her wedding ring. “I remember the pain and agony that poor woman lived through before McCarthy delivered the final stab wounds,” former Dallas County assistant district attorney Greg Davis recalled last week. “She took the most defenseless, the most helpless people, people that trusted her, that she chose to attack,” Davis said. The Dallas County jury had already found McCarthy guilty of Booth’s slaying when evidence during the punishment phase of her trial linked her to the other two slayings and convinced jurors to send her to death row. Prosecutors also showed that McCarthy stole Booth’s Mercedes and drove to Dallas, pawned the ring for $200 and then went to a crack house to buy cocaine. Evidence also showed she used Booth’s credit cards at a liquor store and was carrying Booth’s driver’s license. Booth’s DNA was found on a 10-inch butcher knife recovered from McCarthy’s home. McCarthy said she blamed the crime on two drug dealers she identified only as “Kilo” and “J.C.” There was no evidence to show either existed. McCarthy was tried twice for Booth’s slaying, most recently in 2002. Her first conviction in 1998 was thrown out three years later by the Texas Court of Criminal Appeals, which ruled police violated her rights by using a statement she made to them after asking for a lawyer. 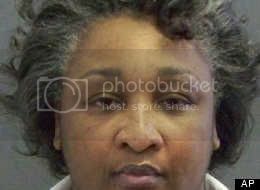 McCarthy is a former wife of Aaron Michaels, founder of the New Black Panther Party, and he testified on her behalf. They had separated before Booth’s slaying. Also: I saw this at another site, must be mention of the same leather head that you're familiar with. "I wonder if David Dow tutored under the former attorney Fred “Leatherman”? He’s seen on YouTube (now convicted felon) dumpster diving, otherwise they sound as though they’re two peas in a pod. Except that Fred was an indifferent lawyer who allowed probable innocent clients to be convicted." The UMass Police Department in conjunction with the Local Police Department is notifying the University community of three incidents near the UMass campus on Jan. 28. •A robbery occurred on University Ave. where the victim was approached by a Hispanic or black male, approximately 5’9”, heavy set wearing a black jacket, black hooded sweatshirt and a colorful polo shirt. Money was taken from the victim. •An attempted robbery occurred on University Ave. The victim was approached by a dark-skinned male, approximately 5’9”, heavy set, wearing a black jacket, black hooded sweatshirt and a colorful polo shirt. The suspect demanded the victim’s cell phone. Can you post a link when you alert us to these events? HUNTSVILLE, Texas -- Dallas County prosecutors say they aren't appealing a state judge's decision to halt the scheduled Tuesday evening execution of a Texas woman. She would have been the first woman put to death in the U.S. since 2010. Yep: Ten seconds after posting the previous comment my Email alert beeped & I knew it was bad news regarding McCarthy. The defense lawyer shopped around for a liberal activist Judge & District Judge Larry Mitchell, in Dallas was all to happy to grant a temporary stay of execution on the grounds that McCarthy's jury was racially bias. They're not even denying that McCarthy committed the heinous murder nor do they contest the previous two murders used to establish aggravating circumstances during the sentencing phase. NOPE!! They're drawing the Race-Card from the bottom of the deck in an attempt to force a new sentencing hearing. Rumpole; Were RT to have a category for A--hole of the day award, I'd nominate District Judge Larry Mitchell for today. Arrrrghh I'm furyass! I have moved this block related to executions to a dedicated thread... CRG appears as the thread author because his post is first post in this thread. A mentally disabled African American is to be executed in the United States, despite outrage from human rights activists and mental health advocates. Warren Hill is set to be executed on Tuesday in the city of Jackson, Georgia, by lethal injection for killing a fellow prisoner in 1990, while serving a life sentence for having murdered another person. It is reported that Hill has an IQ of 70, putting him under the threshold of being mentally disabled. The Georgia Supreme Court has voted 5-2 to deny Warren Hill a stay of execution. Hill is scheduled to be executed tonight at 7 p.m. in Jackson. His lawyers say Hill should not be put to death by lethal injection because Hill is intellectually disabled. Chief Justice Carol Hunstein and Justice Robert Benham dissented from the state Supreme Court’s decision to deny Hill a stay of execution. “We are profoundly disappointed that Georgia’s Supreme Court has refused to stop tonight’s execution of Warren Hill, a person with mental retardation, which we believe is at odds with the U.S. Supreme Court’s protection of the mentally retarded,” Brian Kammer, one of Hill’s attorneys, said. Hill’s attorneys have yet to hear from the State Board of Pardons and Paroles on Hill’s most recent plea for clemency. Hill also is asking the U.S. Supreme Court to stay his execution. 30 minutes before the moment of his lethal injection, two courts stay the execution of a mentally retarded prisoner so that they can evaluate his case. Condemned Georgia prisoner Warren Lee Hill came within 30 minutes of being executed Tuesday night -- came within 30 minutes of becoming a reluctant martyr to a constitutional principle the United States Supreme Court first announced in 2002 in a case styled Atkins v. Virginia: Thou shalt not execute the mentally retarded. He came that close -- already well into Georgia's death penalty protocol -- despite the fact that he is mentally retarded, and that every medical expert who has evaluated him since 1991 now says so. You would think with the precedent established in Atkins, and with Hill's mental status now beyond any reasonable doubt, that the justices in Washington would have been eager to block the execution. But it wasn't the Supreme Court that came to Hill's rescue. The justices instead denied Hill's request for a stay. It is unclear tonight whether they did so because they have no interest in his cause, and thus no interest in defending Atkins; or because they were aware of two other stays issued around the same time. On Tuesday evening, it was the 11th U.S Circuit Court of Appeals, primarily based in Georgia, which blocked Hill's execution so its judges could look more closely at the startling new facts about Hill's mental status which emerged last week. And it was a state appellate court in Georgia which also blocked the execution Tuesday night because the judges there want to look a little more closely at Georgia's lethal injection protocols. This after another Georgia court, and the state's pardons board, had earlier in the day refused to help Hill. Do you know how long the next bit takes? I just had a quick scan of article... looks like he may be accepted as mentally retarded? I don't know the details of the case.. will have to look it up. “In August of 1990, Hill and the victim, Joseph Handspike, were both incarcerated for murder at the Lee Correctional Institution (hereinafter Lee C.I.). Hill was serving a life sentence for murdering his 18-year-old girlfriend, Myra Wright, in 1986 by shooting her eleven times. During Hill’s trial for the Handspike’s murder, a Lee C.I. correctional officer testified that at 5:10 a.m., he heard a loud noise emanating from the inmates’ sleeping quarters in Wing C. Upon entering the wing to investigate, the officer witnessed Hill bludgeoning the victim, who was lying in his bed. The officer quickly returned to his station, called for backup, and opened the security gate to allow other officers to enter and assist. He then returned to the scene and saw that Hill had ceased beating the victim. The officer demanded that Hill surrender his weapon, and Hill complied handing over the board he had used in the beating. A correctional officer and the other witness testified that the victim was attacked while he was sleeping, and that he was unable to defend himself. Witnesses testified the board used to murder the victim was a “2 x 6 that had been trimmed down to a leg,” and that the board had been a support for a sink in the bathroom of Wing C at the institution. In addition, there was testimony that several nails protruded from one end of the board. In regards to the victim’s injuries, a correctional officer testified that the victim was badly beaten in the upper body and face. The victim was bleeding profusely from his wounds, several teeth were knocked out and his left eye was detached from the socket. The victim, who was still conscious, attempted to raise himself and speak to the correctional officer; however, he was unable to speak and had blood pouring from his mouth. Thanks for that update, Rumpole. Didn't know for sure if you wanted these cases all on one thread or should we have made a new topic for each DP case? If a case has got to the point of DP being carried out... just the legal manoevers.. there is perhaps not a LOT to discuss? But..... any case you think has issues worth discussing and some posting... please feel free to start a separate thread. Each case on its own Merits... start threads if you want. 12 years and 2 days ago, Ronnie Threadgill carjacked Christopher Lane’s car. In the course of committing this crime, he fired two shots into the car, one of them struck 17-year old Dexter McDonald in the arm and into his chest. Threadgill drove away with McDonald still in the car, but stopped a few blocks away, dragged McDonald from the car, and left him on the street to die. While his case and this crime may not be as horrific and stomach turning as some of the other cases of recently executed animals, Threadgill had a lengthy criminal past, and 9 LEOs testified at his sentencing that he was trouble. He was a ticking time bomb who never should have been released from prison. The murder of Kevin McDonald is partly on the hands of our too-lenient DOJ, who routinely releases dangerous criminals back into our communities long before they have served their sentences.